Step One: Personalized vaccine stimulates a cancer-specific immune response. A. Cancer tissue is surgically removed by the veterinarian. B. This tissue is shipped to ELIAS Animal Health's manufacturing facility. 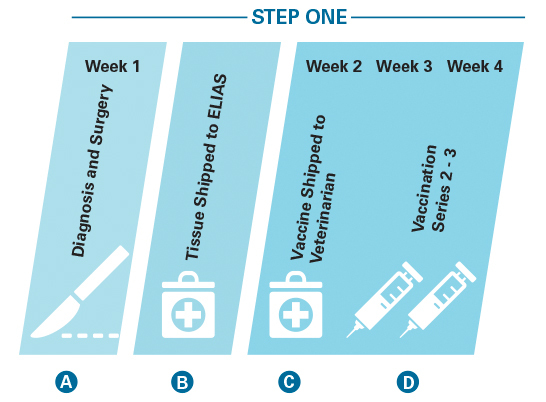 C. A personalized vaccine is produced and sent back to the veterinarian. D. The vaccines are administered on a weekly or bi-weekly basis to stimulate the immune system T cells to recognize the dog's cancer. Step Two: T Cell Harvest and Reinfusion. E. Two weeks following step one, the veterinary oncologist uses apheresis to harvest the population of cancer-specific T cells generated by the vaccination. F. These T cells are shipped to ELIAS for processing. 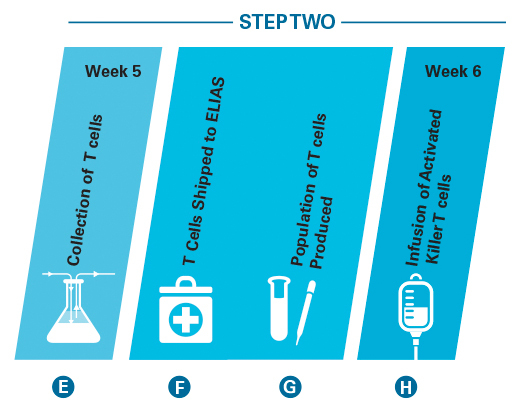 G. A proprietary, patented process is used to produce an activated, blood-derived population of T cells functionally empowered and numerically expanded. H. This tumor-specific population of killer T cells is returned to the veterinarian for intravenous administration. Apheresis is a medical technology in which the whole blood of the patient can be passed through a medical instrument that separates out a particular component, in this case T cells, so they can be removed for further processing. Although every patient and every experience is unique, there is a basic timeframe for ECI treatment and evaluation. After the initial surgery to remove the cancer, a series of vaccinations will follow. After the vaccinations, the personalized T cells are collected and activated. Following intravenous infusion of activated ‘killer’ T cells, there may be several follow-up evaluations. It delivers the potential for tumor-specific cytotoxicity. Clinical outcomes of ELIAS' osteosarcoma trial, as reported at ACVIM in June, showed adverse events were mostly mild to moderate and were typically transient in nature. This personalized approach could be useful for treating numerous types of cancer and may limit or avoid the use of chemotherapy and radiation.